The author in her natural habitat. As far back as I can remember, I’ve wanted to be a nurse—I had no intentions of doing anything else! I always thought nursing was the field for me because I could care for others and be a teacher and counselor, all at the same time. 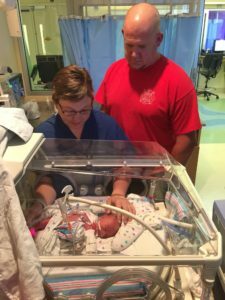 I originally thought I was going to work in the emergency department; I had no idea that the NICU existed. One day, our class took a tour of one of the largest hospitals in Alabama, and one of the units we visited was the NICU. I was immediately drawn to these tiny babies. After that tour, I decided to do my preceptorship in the NICU, and it was then that I fell in love with neonatal nursing. I was very fortunate after nursing school to be offered a position in the NICU. I could not imagine working in any other area of nursing—and that’s where I’ve been since January 2004. 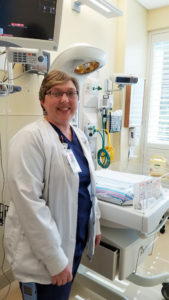 I initially worked as a bedside nurse and then decided to further my education and become a neonatal nurse practitioner (NNP), a role I’ve had for the past 5 years of my career. What I love about the NICU is that premature infants are fighters. I see them defy the odds every day. If you don’t believe in miracles, come visit the NICU. I also love that from the beginning, each one of these little babies has their own personality. They cannot tell you when something is wrong; you have to depend on your assessment skills and their cues to figure out what they need. It’s such a joy to see these infants grow and thrive. What I love most, though, is watching the parents get more and more comfortable caring for their child. I’ve met so many wonderful families during my years in the NICU. They entrust you with their most precious possession, their child. It’s hard not to bond or connect with these people who spend weeks and months in the unit. When I’d been a NICU nurse for about a year, there was a baby I cared for who was born at 23 weeks and spent months in our unit. As I cared for this infant on a regular basis, I really bonded with the family. I remember many times over the months thinking that this patient was not going to survive. This family had the strongest faith I’ve ever seen, and eventually they did go home with their baby. Years later, they brought that child up to the NICU to see me. I was shocked that I touched their lives that much! They recalled specific things I had said or did, and it was one of those moments when I realized that my job makes a difference. I don’t do this job for recognition, but it’s nice to know I made such an impact. After spending so much of my time around other people’s babies, I was excited when I found out my husband and I would be welcoming our own child into the world. I had no complications during my pregnancy, and my only risk factor was advanced maternal age, as I would be 35 years when my son was due to be born. However, Rilee had different plans—I went into labor at 29 weeks and 4 days, and just like that, I went from NICU nurse to the mother of one of those tiny, vulnerable babies. My labor happened so quickly that there wasn’t much time to process it. I didn’t sleep well the night before. I just could not get comfortable but assumed it was normal. I was scheduled to work, so I decided to go ahead and get up early since I wasn’t sleeping anyway. While in the shower, I began to hurt and feel nauseated. Even then, I still didn’t process that I might be in labor. I figured if I was still hurting when I got to work, I would go to Labor & Delivery and get checked out. Rilee made his appearance more than 10 weeks early. While trying to get dressed and ready for work, the pain was worsening. I began to vomit and feel the urge to go to the bathroom. That’s when it finally hit me that I might be in labor. I woke my husband up, and he drove us as fast as possible the 75 miles to the hospital. About halfway there, my water broke in the car. The contractions were coming every 2 minutes, and I was focusing on trying to keep my legs crossed because I could feel the baby’s head. When we arrived at the hospital at 6:15 a.m., I was completely dilated. There was no time for any medications or an epidural; I pushed twice, and Rilee was born at 6:30 a.m. I was in complete shock, and it took a little while for me to really process the fact that I had given birth more than 10 weeks ahead of schedule. Having worked in the NICU for so long, I had some idea of what would happen next. I knew he would require oxygen and have apnea/bradycardia episodes, and I was prepared for him to not be a great PO feeder. What I was not ready for was the pain I felt as he struggled to breathe and had episodes. 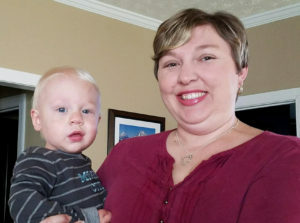 As a nurse, I knew it was totally normal, but as a mom, I was disappointed every time he took a step back and that he was not progressing at the pace I wanted him to. April and husband Thomas visiting with their son, Rilee. Working in the NICU may have prepared me for what to expect medically, but it did not prepare me for what I was going to experience emotionally. I had no idea the guilt I would have for not carrying Rilee to term. I felt my body had failed me, and I had failed my child. I mourned those last 2.5 months I missed out on and my lost chance at a full-term pregnancy. It may sound silly, but I felt cheated out of normal experiences like maternity pictures or being pregnant at my two wonderful baby showers. One of the hardest things I had to do was to leave my baby. When I was discharged and had to leave Rilee for the first time, I sobbed the entire ride home. It’s just not natural to leave your child. I had envisioned giving birth and leaving the hospital with my baby in my arms. It’s also difficult letting others care for your child. As an NNP, I’m used to making the decisions and caring for the patient. It’s hard to just sit back and feel so helpless. I felt like I had to put on a brave face because I worked in the NICU, but there were days I felt like I was falling apart. I was stressed, exhausted, and anxious. I went back to work when Rilee was 9 days old. That may sound quick, but I wanted to save my maternity leave for when he was discharged. My hospital was great, and I was allowed to come back even though Rilee was a patient in my unit. I did not care for, round or make decisions on my son, but it was nice to be able to go back to work and visit him on my breaks and during my downtime. April checking in on Rilee’s progress in the NICU. My sweet coworkers were wonderful to Rilee, as well as to my husband and me. We both felt like my son was given extra-special care and attention. The nurses celebrated his accomplishments and milestones with us; they also let me cry and vent to them. 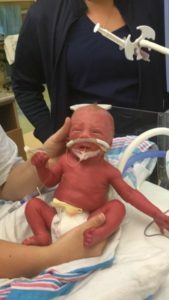 A few of my coworkers have had premature infants, and they understood exactly how I was feeling. 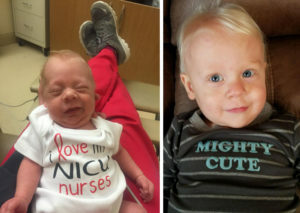 One particular experience with my nurses will always stick with me: When Rilee was about 3 or 4 weeks old, the night shift nurse asked me if I wanted to help bathe him. I know this may sound silly to some, but I appreciated it so much. Working in the NICU, I have bathed many babies—but this time, I got to bathe MY baby. This little thing really meant a lot to me. 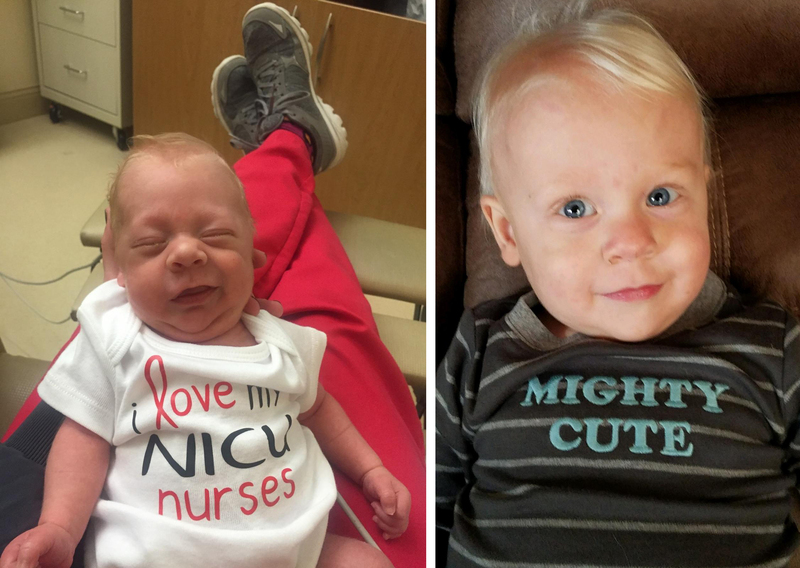 Knowing what to expect as a NICU nurse was a blessing and a curse. 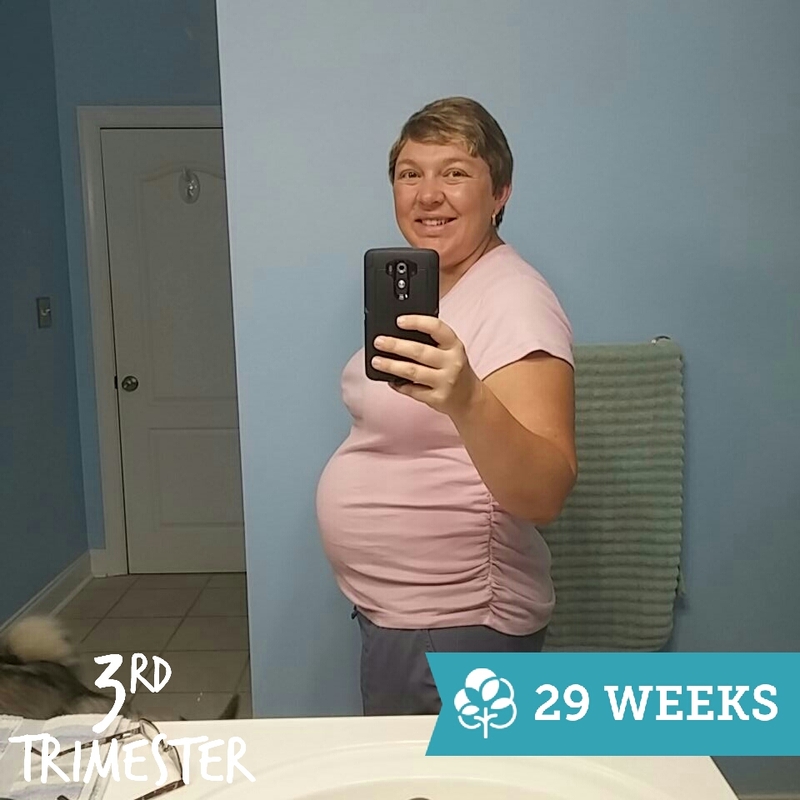 I knew Rilee was doing well for 29 weeks, but I also knew all of the things that could go wrong. I was constantly waiting on something bad to happen. 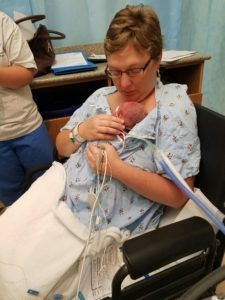 I had a hard time enjoying my baby and how well he was doing for the fear of the “what ifs.” I remember saying multiple times during his NICU course that I couldn’t believe how well he was doing, but that I didn’t trust him. I also got anxiety when it was time for a test, such as a head or cardiac ultrasound. When all was said and done, Rilee was in the NICU for 50 days. 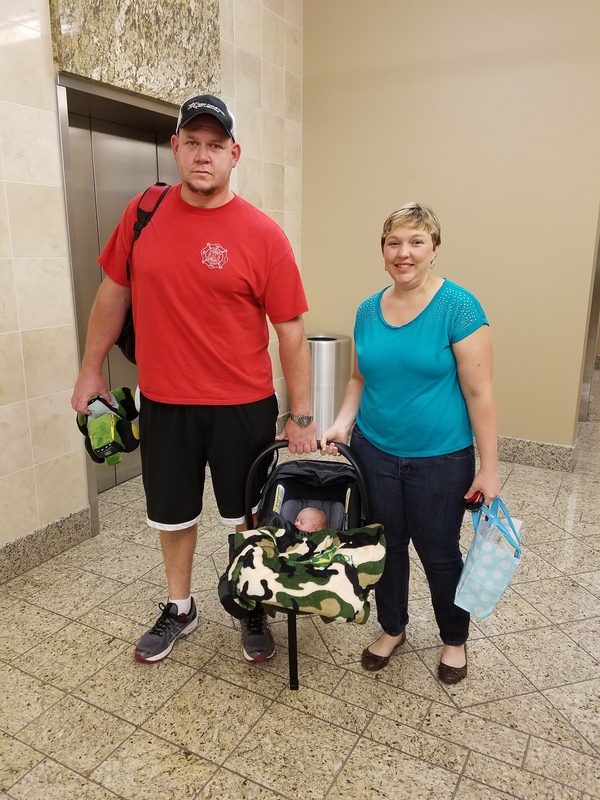 He was discharged home at 36 weeks and 5 days. Being a NICU mom has definitely made me change my way of thinking when it comes to talking to parents. I know each and every mother’s experience is different, but I feel like I can empathize now. Sometimes when mothers are having a hard time or feel like no one understands them or their situation, I just sit down and talk to them. I let them vent and tell them I understand. My experience may be different, but I do understand. Sometimes I do share my experience with a mother if I feel led to or if I think it will help. Skin-to-skin care is good for baby and mommy. I’m also quick to make sure mothers are holding their babies or doing skin-to-skin as soon as medically possible. I felt like this helped me to bond with Rilee and with my breast milk production. I also encourage moms to start pumping right away. I think pumping made me feel like I was actually doing something for my son at a time when I was virtually helpless—I was unable to care for him, so making milk was my contribution. It was the one thing that only I could do for him. To women who find themselves in the NICU, I would say to take it one day at a time. Your baby will have good and bad days—you will have good and bad days. It truly is a roller coaster ride. Lean on friends and family for support. Find a NICU support group, which is great for parents to bond and share their experiences with one another. Don’t be afraid to ask questions or voice your concerns. You are the voice for your child; you are their advocate. 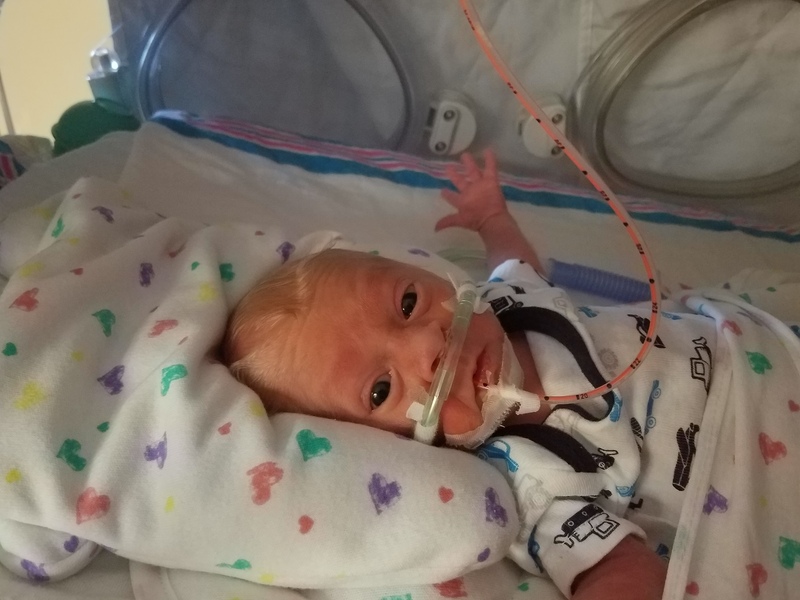 For fellow NICU nurses: Talk to the parents of these tiny, vulnerable babies. Listen to their concerns, and ask them how they’re doing. Sometimes they just need someone to talk to. Also, get them involved wherever possible. Encourage touching and holding. Ask them if they would like to help you take a temperature or change a diaper. It’s their baby, and they would like to feel like they are contributing. I will always remember when I got to bathe my son while he was in the NICU. Small gestures like this will mean more than you will ever know. 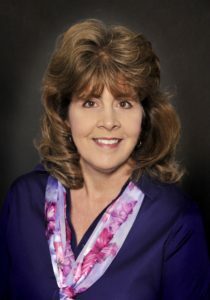 April Farmer, CRNP, NNP-BC, is a neonatal nurse practitioner in Birmingham, AL.